Joseph Heginbotham was a very important part of Stoney Middleton’s history. 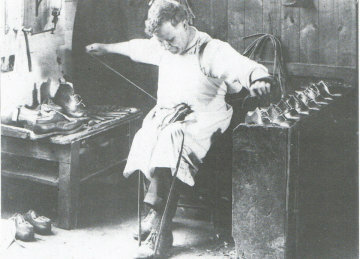 He stablished his family business in 1884 with his sons Luther, Mathew, William, and Harry the inventor of the steel toe cap boot originally made for miners in 1933. The family business had various factories in the village, including Craigstead (1896-97) a brick built factory on High Street as well as what is now Prefect House next to the butchers on The Dale. b) Hannah’s original marriage citation in Stoney’s parish register says she was of Stoney Middleton, not Foolow or Eyam and one of her witnesses was “John Hancock”–Hannah could have gone into service at Stoney, but there is no evidence for same. The Hannah in Foolow had a brother called John, but he was five years old when Hannah Hancock married Henry Heginbotham. Hannah did have an uncle called John Hancock of Foolow who could have signed the wedding certificate, but if so, it seems more likely that Henry Heginbotham of Great Longstone and Hannah Hancock “of Foolow” would have married at Eyam, the parish church for Foolow, not Stoney. Henry clearly started out at Great Longstone; Stoney as the marriage site makes more sense if Hannah was of Stoney, not Foolow. c) Henry and Hannah (Hancock) Heginbotham had children called John, Ellen, and Frank–John and Ellen had occurred among previous Hancocks of Foolow, but never Francis or Frank, and these names in this immediately branch of the Heginbothams hadn’t occurred recently either (the Heginbothams were partial to William, Joseph, and Matthew as male names, for instance, not Francis). There were only two couples called Hancock baptising children at Stoney Middleton in the late 1700s and very early 1800s: Francis Hancock and his wife nee Mary Drabble, and Francis’s elder brother John Hancock and his wife nee Ellen Hallam. Francis and Mary (Drabble) Hancock had other children in the period of 1805-1808 (William in 1805, Francis in 1807, and Archelaus in 1809), but John and Ellen (Hallam) Hancock who married in 1790 have a gap in the listed baptisms of their children at Stoney Middleton between Peggy in 1804 and Sarah in 1809, where I believe two children were born (Hannah in 1806 and Archelaus either in 1807 or 1808 (though they could have been twins born circa 1807–their ages in various censuses seem to suggest that Hannah wast at least a year older, though). I think it more likely that Hannah Hancock, daughter of John Hancock and Ellen Hallam and younger sister and niece of men called Francis Hancock married Henry Heginbotham in 1826 and had children called John and Ellen for Hannah’s parents, and Frank for her elder brother closest to her in age. The John Hancock who signed her wedding certificate in the Stoney Middleton parish register was thus probably either Hannah’s father or eldest brother, both John Hancock’s of Stoney Middleton. Colin, this has implications for you, by the way, because if I’m right (and I think I probably am on this one), this is how you’re a descendant of the Hallams and related to me. That John and Ellen (Hallam) Hancock had children whose baptisms didn’t survive is pretty certain in that there are definitely two Archelaus Hancocks from the Stoney/Eyam area, almost exactly the same age, who were a) the son of Francis Hancock and Mary Drabble (whose baptismal record exists and who ended up married to one Martha Dungworth and living in Sheffield) and b) the apparent son of John and Ellen (Hancock) Hallam–this Archelaus probably married Mary Cocker of Stoney Middleton, somewhat his senior, and stayed in Stoney, leaving many descendants. I’m mindful of our cousin Rodney Marples’ admonishment “don’t conjure” in terms of looking for individuals without baptisms, but in this case I do think the census, parish register, and onomastic (naming pattern) data suggest that Hannah Hancock later Heginbotham belonged to the Hancocks of Stoney Middleton, and not those of Foolow. Thanks to you and to Mr. Greenwood for a great file! a couple of other comments on the Heginbotham file. Robert Heginbotham, barytes manufacturer at Stoney, married, as noted, Nancy Cundy. Per the research of Rosemary Lockie, nee Goddard, Nancy’s mother was Barbara CROOKS of Great Longstone, the widow of Amos Mason of Stoney Middleton, and ancestress also of most of the later Masons at Stoney. And Robert Heginbotham’s nephew, John William Heginbotham (1850-1890) did indeed marry a Hallam, but it wasn’t “Harriet”, it was Hannah Hallam (1852-1895), youngest sister of my great-great-grandfather John Hallam 1835-1907, the subject of the 1851 Indenture you’ve added to the website. John Wm and Hannah (Hallam) Heginbotham had no children, and sadly both died fairly young. Robert and Nancy (Cundy) Heginbotham’s three daughters had interesting lives–the two elder married the brothers Taylor from Bedfordshire. I forget which, but one of the Taylors spent a fair amount of time in India, too. The third and youngest Heginbotham daughter married a Broomhead from Sheffield, from a family of attorneys and insurance agents. One of their daughters, Barbara Helena Broomhead, married her maternal first cousin, Charles Lewis Taylor.